Two years after TriMet’s first independent, third party analysis of the agency’s fare enforcement practices, a new analysis once again finds no evidence of systemic racial bias. Dr. Brian Renauer, with Portland State University’s (PSU) Criminal Justice Policy Research Institute, conducted both the 2018 and 2016 reviews. His latest analysis examined just over 48,000 fare enforcement incidents on the MAX Light Rail System from March 2016 to March 2018. Renauer’s analysis uses TriMet’s fare enforcement and ridership statistics, as well as our fare evasion survey. It’s believed that TriMet is the only transit agency in the U.S. to use a survey of fare evaders to examine for racial disparity. “Comparing the racial/ethnic breakdown of fare evaders in the 2016-2018 fare evasion surveys to the racial/ethnic disparity in actual fare evasion outcomes reveals little to no disparity,” said Renauer. According to Renauer, repeat fare evasion is still a unique challenge for TriMet. His 2018 analysis found that in nearly 34 percent of incidents, the person evading fare had been involved in at least one other incident during the two-year study period. That percentage grows when it comes to African Americans. “In 46 percent of incidents involving African Americans, the rider involved had at least one other fare evasion during the two-year time frame,” said Renauer. While Renauer’s 2016 research had noted that African Americans received exclusions at a slightly elevated rate, his 2018 report found that rate had dropped below the threshold for disparity. With his latest analysis, TriMet asked Renauer to dig deeper on the data. “The results of this effort (a more in-depth examination) illustrated the presence of a small group of chronic fare evaders and persons receiving repeated exclusions,” said Renauer. Renauer concluded that small group who continually engage in fare evasion led to the elevated rate for exclusions, and was not the result of racial or ethnic biases. His research found that 56 people accounted for about 25 percent of the 732 exclusions given to African Americans during the past two years. If those 56 persons had only one exclusion, instead of three or more, the exclusion rate would have been 4 percent lower according to Renauer. The analysis found a 16.6 percent fare evasion rate on the MAX system in 2018. That’s up from the 14.5 percent noted in the 2016 report. 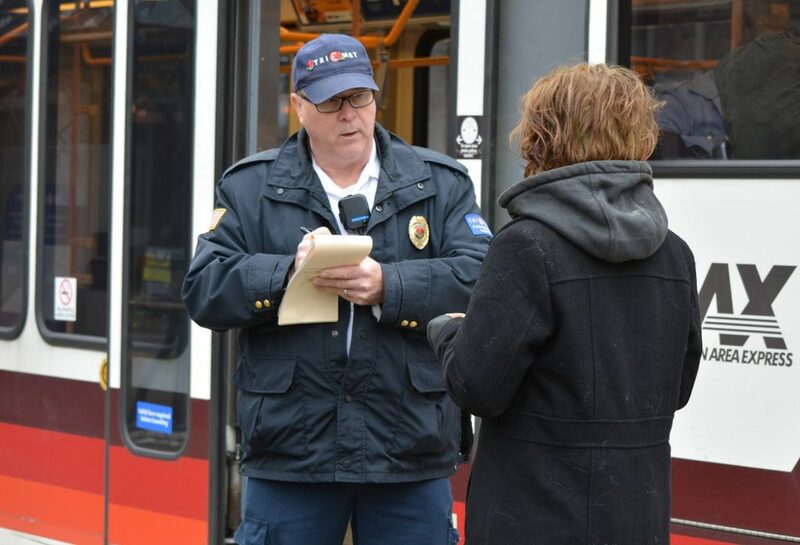 TriMet is working to increase fare enforcement on the system. TriMet has signed a contract with Portland Patrol Inc. for a new type of contract security officer to patrol the transit system. Within a year’s time, we expect to have up to 30 personnel with a peace officer background providing a security presence while conducting TriMet Code enforcement, including checking fares. TriMet also recently took steps to decriminalize fare enforcement and bring greater equity to the process and our transit system. We believe these efforts will help reduce fare evasion, and may stop some people from continually evading fare. Reduced fares for those on a low income: TriMet expanded the Honored Citizen fare program so adults who earn less than double the federal poverty level qualify for discounted fare. The Honored Citizen fare is half the price of a single ride or day pass, and an Honored Citizen month pass is 72 percent less than the cost of an adult month pass. Already more than 1,500 people have enrolled in the Honored Citizen program based on income level. New penalties for adult fare evasion: TriMet now provides adults caught without a valid fare new options to resolve their fare citations without entering into the court system. The person may qualify for a reduced fine or community service. Those who qualify for our Honored Citizen program, based on age, disability or low-income level, will have their fine voided if they successfully enroll in the program. In the first five weeks since the options went into effect, 38 people have had their citations waived by entering the Honored Citizen program. TriMet provides safe, reliable, affordable and valued transit service for more than 310,000 customers a day throughout the Portland, Oregon metro area. TriMet’s bus, MAX Light Rail, WES Commuter Rail and LIFT paratransit operation cover a 533-square mile service area, connecting people with their community, while easing traffic congestion and reducing air pollution.